Wildlife holidays have always been popular but with eco-tourism having become quite the huge business it now is, the market share and economic importance they enjoy today has grown enormously over recent years. Fifteen years ago “nature tourism” made up less than seven per cent of all international travel revenue; today that figure is nearly three times greater – and rising. Much of this sector of the tourist trade inevitably involves some of the wilder regions of the world – Africa, Asia or South America – where exotic flora and fauna are still to be found, though often their habitats are fragile. Historically, the numbers of visitors has sometimes put the local environment under considerable pressure – delicate eco-systems quite literally in danger of being trampled underfoot. However, recognising the problem and the very real benefits – both environmentally and economically – to be gained from the genuine eco-tourist market, significant numbers of tour operators have reacted quickly to offer suitable options to get around these problems. 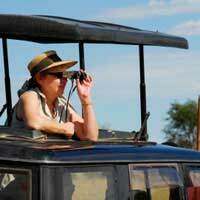 While these opportunities cover a wide range of wildlife breaks, it is the appeal of the safari which remains enduring and as the quickest flick over your travel agent’s shelves – or an even quicker online search – soon reveals, plenty of companies are ready to offer you something. Wildlife-spotting trips to India, South East Asia and Australia aside, the word “safari” – the Swahili for “journey” – is about as full and redolent of Africa as it is possible to be. If Africa is the home of the safari, then the famous “big five” – lion, elephant, leopard, buffalo and rhino – once the target of hunters, have got to be what it is all about for the modern breed of safari guest. If the people have changed, so too have the events themselves. Today, the best of the eco-safaris will, of course, take you to see animals a-plenty, but their contribution does not stop there – supporting conservation initiatives and research programmes, providing local employment and returning money into the local economy. Many of the operations are set up to have minimum impact, using solar power and conserving water where possible, for instance. Selecting the right company is always important for any eco-holiday, but when your journey will take you to unique landscapes, fragile ecosystems and vulnerable wildlife, it becomes critical. There are so many companies all waving what seem unassailable eco-credentials that knowing which one to pick can be very hard. However, with a bit of research you should be able to get a feel for who is genuine and who is indulging in a lot of heavy green-washing.Gamewatchers Safaris, for instance, specialise in providing small, exclusive camps in private wilderness reserves. They take a limited number of visitors for a truly wild Kenyan experience, away from the swarming tourist vehicles typical of “traditional” safari holidays. Money is ploughed back into a number of sustainable projects in the area and employment generated for local people, which benefits both the wildlife and the community. Porini camps are based on a similar principle. Innovative, small and sited in “conservancies” – land which is outside public areas such as the Amboseli and Maasai Mara reserves and leased directly from the local Maasai people, these camps are the last word in low impact safari living. Staffed by locals, each camp has only six tents and enjoys solar power and proper waste management facilities. The name “Porini” – an acronym for the Protection of Resources (Indigenous and Natural) for Income – is also Swahili for “in the wild” and seems particularly appropriate on both counts. IntoAfrica offer a variety of trips in Kenya and Tanzania, with a heavy emphasis on the benefits to the area which sensitively managed tourism can bring, providing what they describe as “an intelligent traveller's alternative to the myriad adventure treks and safaris.” Their ethic is strongly based on allowing local peoples to profit directly from their traditional lands – and they pride themselves on the interaction this makes possible for their guests. However, if your style is more “Gorillas in the Mist” than “The Lion King”, you need not be disappointed. Nature Link Safaris, for example, specialise in Gorilla and Chimp safaris in Uganda and Rwanda, their aim being to offer “quality, sustainable eco-tours” which also include cultural safaris, mountain climbing and bird watching. There are few experiences quite like sitting in a Land Rover on the Maasai Mara, looking at the breathtaking wealth of wildlife or the uncanny apparent emptiness of Amboseli National Park – until a herd of buffalo seemingly materialise out of thin air. Africa is an extraordinary land and today – with camera shutters replacing the sound of rifle-bolts – animals that might once have fallen to the hunter’s gun, can now make a contribution a thousand times more valuable and it is the timeless appeal of the safari that makes it possible.